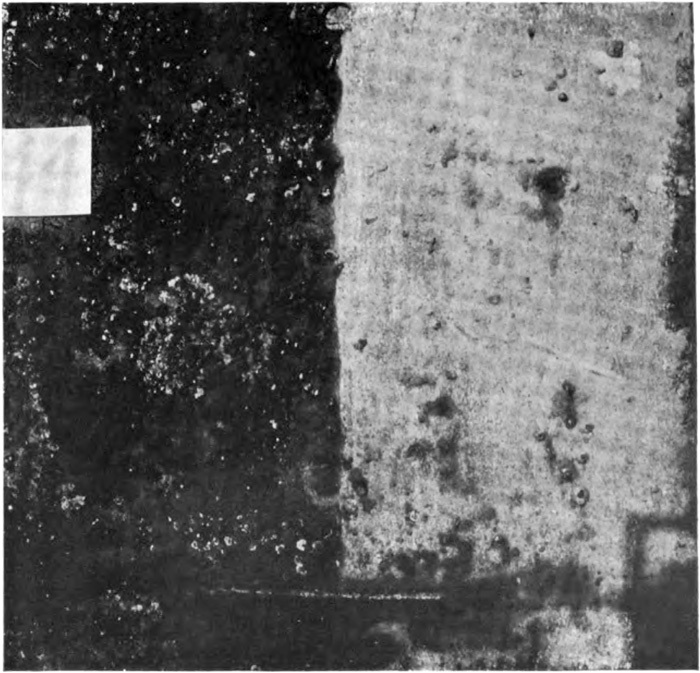 View of painted steel plate after alternate exposure to salt water and air. Paint on left-hand side contains excess pine tar and is badly fouled with barnacles. Paint on right does not contain pine tar and is in excellent condition, considering time and severity of exposure. Image at page 7, illustrating Henry A. Gardner, Marine Paints. Bulletin 52 (April 1916). Educational Bureau, Scientific Section, Paint Manufacturers’ Assocation of the U.S. Philadelphia Pennsylvania. Image quality as is, from Google scan of University of Chicago copy, digitized March 1, 2012.